Puzzle: Another puzzle from the Reflections series, this one depicts a peaceful landscape with a mill, flowing water, a covered bridge, and flower gardens. Serene and easy-to-assemble, it makes for a relaxing activity. 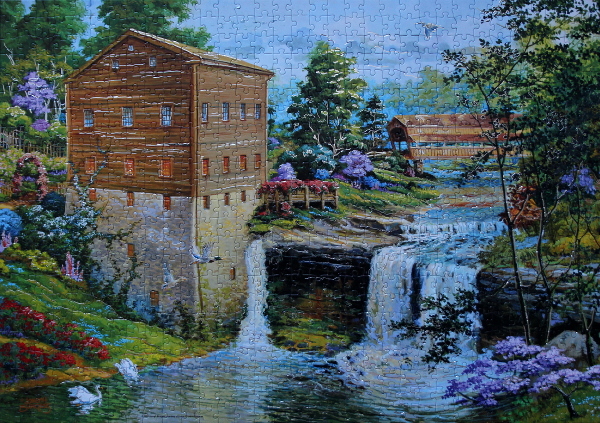 Good places to start are the mill building, its border with the sky, the flowing water, the bridge, and red and purple flowers. The ledge over which the waterfall flows as well as the tree trunks on the right can provide a horizontal and vertical guides respectively. The remaining colours are distinct and the areas small, so the rest of the pieces easily fall into place. 750 pieces, Mega Puzzles, puzzle, Reflections. Bookmark.